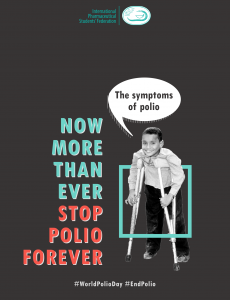 首頁 » 最新消息 » 國際交流 International Exchange » 世界日 World Days » What are the symptoms of polio? 95 to 99 percent of people who contract polio virus are asymptomatic- this is known as subclinical polio. Even without symptoms, people infected with poliovirus can still spread the virus and cause infection in others. One percent of polio cases can develop into paralytic polio. -paralysis in the spinal cord (spinal polio), brainstem (bulbar polio), both (bulbospinal polio).